With their tall, upright shape and disc-like flowers, hollyhocks add a bright burst of color and height to a garden. Hollyhocks grow up to 10 feet tall with single flowers that bloom along the tall spike. Blooming during summer, hollyhocks have a clumping growth habit and moderate growth rate. Alternatives to hollyhocks have similar shapes and growth habits to create an equally striking garden design. Kopper king hibiscus (Hibiscus 'Kopper King'), similar to the hollyhock, has disc-like blooms that grow in a wide range of colors including white and pink. 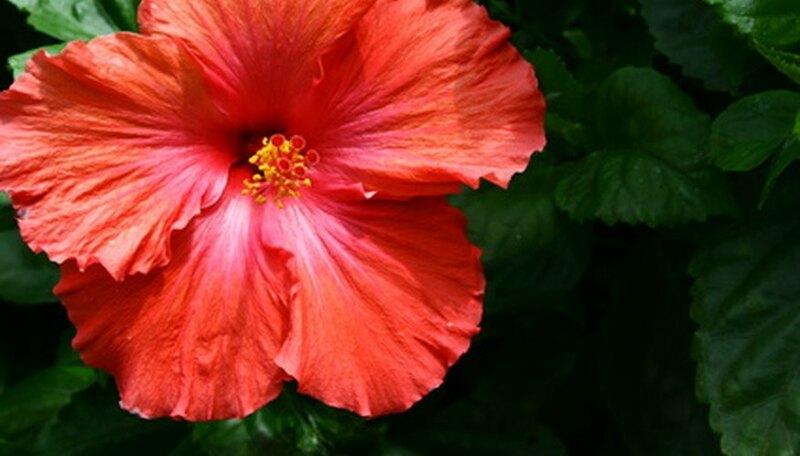 Growing 3 to 6 feet tall and 1 to 3 feet wide, kopper king hibiscus flower blooms are ruffly and grow 10 to 12 inches wide, making for a large flower head. The red “eye” on the kopper king hibiscus contrasts with the petals, similar to the display of the hollyhock bloom. A butterfly attractant, kopper king hibiscus grow in upright clumps, like the hollyhock, and have bronze to red foliage. Flowers emerge beginning in mid-summer and light up the garden through fall, making for a long-lasting blooming season. Kopper king hibiscus requires full sun to part shade and moist, nutrient-rich soils. To promote a long flowering season, remove the spent blooms. The USDA Hardiness Zone for planting is 4 to 9. Rose of Sharon (Hibiscus syriacus) is a deciduous shrub that has similar blooms to the hollyhock. The crepe-thin petals grow 2 to 4 inches wide and come in a wide range of colors including red, violet, white, purple and some variegated blooms with more than one color swirled together. Like the hollyhock, rose of Sharon grows tall, between 8 to 10 feet. Its width, 6 to 10 feet, helps to create a privacy barrier for the garden or planted as a focal point to the landscape. Rose of Sharon has dark green to medium green leaves that grow 2 to 4 inches long with a toothed edging. Drought-tolerant, rose of Sharon blooms in summer and lasts into the fall. Rose of Sharon requires full sun to partial shade and well-drained, moist soils to flourish. The zone for planting is 5 to 8. Grown along tall stalks, similar to hollyhocks, monkshood (Aconitum spp.) is an upright perennial that is an ideal alternative to hollyhock. The blue to purple hood-shaped blooms grow in upright spikes up to 48 inches tall and are oftentimes tinged with yellow. Emerging in mid to late summer, the toothed, deep green leaves of monkshood are lobed and present themselves in clumps. Monkshood prefers full sun to part shade and moist, well-drained soils. To grow in other areas of the garden, divide monkshood in the fall. The zone for planting is 3 to 7.